What do ping pong balls have to do with conversion rates? It’s all about focus and “message reception”. Recently, Rick and I have been giving landing page workshops to small businesses and start-ups, and we always kick things off with a game that involves ping pong balls… and an unwitting volunteer. Our purpose is to illustrate the importance of focused messaging on your landing pages. With so many messages on your homepage, the purpose of your upstream ad gets lost in the clutter. (Graphic produced using wordle.net). If you’re the type that has ping pong balls lying around, pick ’em up and join in. Quick tip: don’t use golf balls as a replacement, they hurt. (If we meet in person, ask me to explain the golf ball incident). First, throw a single ping pong ball at the volunteer. Typically they’ll catch this ball – representing a customer dealing with, and receiving, a single focused message. Next, throw 4 balls at the same time. Most people will catch one or two, some miss them all entirely. You get the point – juggling is hard. To be extra clear. The point is that by sending your marketing traffic to an unfocused landing experience you risk them missing your message. It’s not rocket science, marketing science, or even particularly complicated. It’s simply a matter of attention and focus. Despite the proliferation of Yoga here on the west coast, we’re still part of the Ritalin-infused attention deficit generation – which means the brains of our potential customers can absorb only a finite amount of information in the few seconds they are willing to spend on our websites. If you want to increase your conversion rate, make sure your customers only have one thing to do at a time. 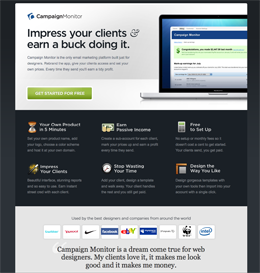 Campaign Monitor have a beautifully designed site. 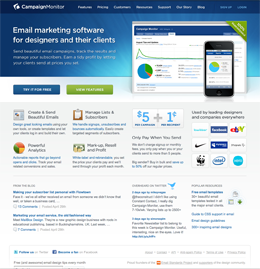 And they also do a cracking job of producing focused landing page experiences. Let’s take a look at their homepage vs. a landing page. This is how a homepage should be. Clear navigation and multiple methods of self-exploratory interaction. But it’s too indirect to be the destination of a marketing campaign. (Despite how good a job they’ve done here). By contrast, the landing page has only 1 thing to click on! The call to action (CTA) is clear and prominent, and there is enough supporting information to allow you to make an informed choice. Guideline 1: Always begin with the product or service you are marketing and create a concept based on this. Guideline 2: Create a landing page that distills your offer into it’s simplest form. Use 1 primary call to action. Guideline 3: Only now should you work on your ad messaging (banners, PPC, email). The message match between ad and landing page is critical. You may have to go back and forth to tweak ad and landing page copy until they work well in unison. Short of electric shock therapy, and other forms of negative reinforcement, the best way to break the cycle of throwing marketing money down the toilet is simply to try something different. Try building a landing page and start driving your traffic through a more focused marketing funnel. Once you start seeing higher conversions and a more flexible environment for changing & testing your message, you’ll never go back.